We’d love your help. Let us know what’s wrong with this preview of Black Hole Focus by Isaiah Hankel. .". ".an absurdly motivating book." -"A.J. Jacobs, New York Times bestselling author" "
Through personal (and sometimes embarrassing) stories, Dr. Isaiah Hankel breaks down the primary driver behind the actions of successful people: .". ".an absurdly motivating book." -"A.J. Jacobs, New York Times bestselling author" "
To ask other readers questions about Black Hole Focus, please sign up. Isaiah has written an excellent guide to help all of us be more driven to be who we want to be. What made this book stand out for me was the authors attention to referencing published research on the topics he is discussing. This not only lends weight to his case, but also provided me with the opportunity to go deeper. Reading this book makes it clear that more is not only possible, but achievable. All you have to do is decide what you want to do, make your plan, and start walking. This to me is Isaiah has written an excellent guide to help all of us be more driven to be who we want to be. What made this book stand out for me was the authors attention to referencing published research on the topics he is discussing. This not only lends weight to his case, but also provided me with the opportunity to go deeper. If you've ever felt "stuck" with where you are in life and wanted to be inspired on how you can make a change. This is a book I'd recommend you to read. Concepts in the book aren't "revolutionary", they're practical, simple steps to help you structure your thought process, have it documented and realizing it step by step. I like that each of the chapters are not very long and comes with a theme and I've actually done quite a bit of thinking reading this book. Don't rush it through, take a moment If you've ever felt "stuck" with where you are in life and wanted to be inspired on how you can make a change. This is a book I'd recommend you to read. Very easy and motivating book. I was and still kind of stuck in my life at this time, but because of the many advices I'm able to look at my challenges in a different way. If you are stuck, just read it and enjoy it! Probably the most inspiring book I have ever read. If you follow the steps you will be so much better prepared to attack your goal. A book you will keep coming back to. Amazing book about purpose and how you can live your dream life , the only limits you have is the ones you make . 10% common sense, 90% ramblings and anecdotes. Nothing new. I liked the to-the-point writing style and idea sharing. I will be referencing back to this book regularly. 1. If you read the table of contents you'll get everything out of this book and save yourself quite a bit of time. If want to say that you got all the details read also the first sentence of each chapter. 2. Maybe I've grown up on another planet but I'd surely laugh my a.. off if I'd hear someone expressing their life mission with so many empty buzzwords as the ones in the book. This is one of the most mind-blowing self-learning books that I have read. There is a considerable research made behind every single sentence written in this book. It is not a typical self-helping book. I will definitely recommend this book to most people. A good book about goal setting, four star till page 90, the rest can be skipped as it does not add anything, just a collection of suggestions not bound through any logic sequence. The best part of this book is relatability. Learning from someone with a similar background, similar challenges and similar doubts about the future and change is priceless. Make sure to take actions and not just read the book. The action steps described in details are transformational. From discovering your purpose and the driving force (AKA your WHY) to an evaluation of the current position, from defined priorities to creating benchmarks, from vision to decision to conviction. This book is packe The best part of this book is relatability. Learning from someone with a similar background, similar challenges and similar doubts about the future and change is priceless. Make sure to take actions and not just read the book. The action steps described in details are transformational. From discovering your purpose and the driving force (AKA your WHY) to an evaluation of the current position, from defined priorities to creating benchmarks, from vision to decision to conviction. This book is packed with inspiring stories and believe me, it is packed with scientific proof and data to back up any statement made. The book brings what it promise with the title - purpose creation for intelligent people. There are some new ideas, but mainly older/known ideas re-told in such way that would appeal and make sense to an intelligent mind. This book needs to be studied and applied in practice. Really LOVED this book and would recommend it for anyone thinking through what is going to make them more passionate in their careers and lives. Nothing particularly new or particularly motivating beyond the idea of striving to achieve those crazy dreams you really actually want, instead of the achievable mundane goals we chase instead. A personal Mission Statement. Think about it for a bit, do you need one as root for your life's purpose? I certainly didn't think so, that is until I read Dr. Hankel's Black Hole Focus. Isaiah has put together in a fun, quick read book a roadmap that I'll reference frequently to redefine, repurpose and transform my life. I was already on the way to beginning a personal, cleaning house. Now I have the missing tools I needed to finally get me where I want to be. A must-read for anyone ready to dro A personal Mission Statement. Think about it for a bit, do you need one as root for your life's purpose? 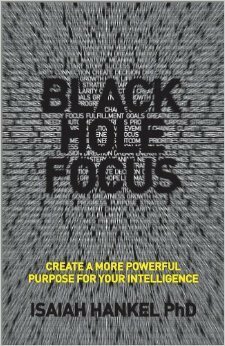 "Black Hole Focus" absolutely nails down the importance of finding and developing a purpose and passion in life. With each passing year, I am now able to look back and see how vital it is to have had purpose at every stage in my own life, and I can now easily identify the times when that purpose went astray. This book is the key in how to take those world-changing ideas, communicate them effectively, and make them a reality. Starts off with some good points but degenerates into a goal setting book. Goal setting doesn't work for me - actually it doesn't work for most people. If you are curious, google "why goal setting doesn't work" and read the articles. Disappointed - was hoping for something new. For a first book this is really good. Very inspiring and an easy read. Un buen intrumento para organizar prioridades, enfocarse en metas específicas y alcanzar objetivos personales y profesionales. Incredible! A pure game changer. Dr. Isaiah Hankel is a Fortune 500 consultant, international speaker, and author. His expertise, presentations, and writing focus on helping individuals, teams, and organizations accelerate into the fast-paced, entrepreneurship-driven market. Isaiah combines a scientific approach with a tangible methodology to create a system any individual or company can use to adapt to today’s entrepreneurial mi Dr. Isaiah Hankel is a Fortune 500 consultant, international speaker, and author. His expertise, presentations, and writing focus on helping individuals, teams, and organizations accelerate into the fast-paced, entrepreneurship-driven market. Isaiah combines a scientific approach with a tangible methodology to create a system any individual or company can use to adapt to today’s entrepreneurial mindset.